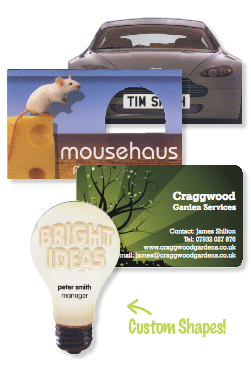 Die Cut Business Cards, printed using our highest quality litho printing service. These full colour matt laminated business cards are printed on the finest quality 400gsm card and covered both sides in smooth matt laminate for extra durability. They are die cut to shape using one of our free die cutters or you can request a special shape to order. The following standard die cutter shapes can be used for free. If you are creating your own artwork, please download the cutter guide below (pdf download). How do I pay for Die cut colour business cards ? Do I need artwork for die cut colour business cards? You can look at Digital Business Cards to compare prices. Printline Advertising is a printer in Leeds. We have been printing in Leeds since 1983.